Imagine you wake up one morning and the world around you has changed completely. All your neighbors have become brainless zombies and you can only defend yourself by throwing Dire Straits LPs at them. Or suddenly, everyone you know goes by the name Dave. From left to right: David, David, David, David, David, David, David, David and Phil. With David J. being back in England, David L. injured and David C. taking part only in short trips morning rides, one would assume that the amount of Davids that could be assembled for a ride in Bozo peninsular would be somewhat limited. 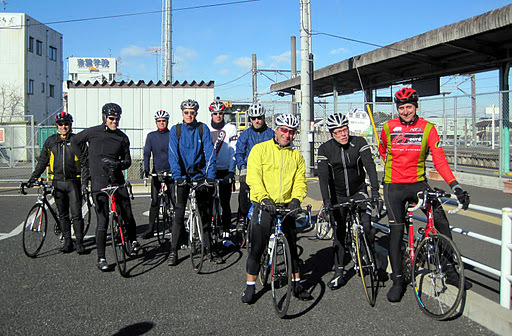 Nevertheless, when Phil of TCC called for a joint winter ride in Chiba, all remaining cycling Davids and very few other guys turned up, eleven riders in total. We were quite a group: David Dachin (younger brother of James), David Denderson aka as Dominic Denderson and me, the D.O.B. were attending the tour on behalf of Dositivo Depresso. Phil has warned us that this would become a leisurely ride, adding that we must make 30 km/hr average along the first third in order to be home on time, so we started rather fast and within no time we have also lost some riders of our group. But we always stopped and let the slower riders catch up so that we might have had a good speed average, however the overall progress was rather slow. It is always interesting to ride in the countryside of Chiba, I believe that I can say that as an expert who has ridden there with Phil already two times. Every time and without him, I would be lost and probably still would ride clueless in Chiba looking for the exit between the vast stretches of land belonging to golf clubs. 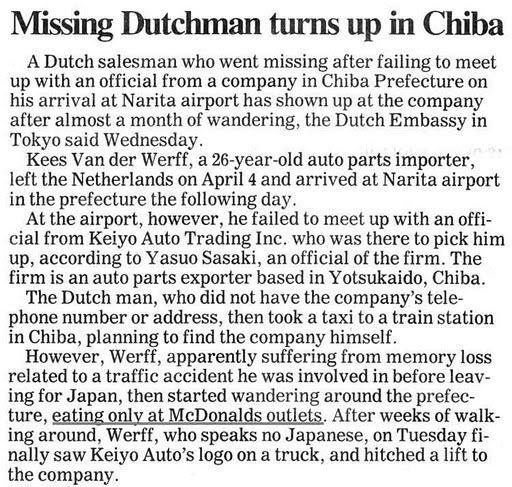 Nine years ago a Dutchman by the name of Kees Van der Werff got so much lost that he found Chibas‘ exit only after weeks (exhibit 1, at the bottom of this post). It is also interesting to note that Chiba is not flat at all and consists of many hills, not a single one higher than 400 meters, but some of them quite steep and all in all we were able to do much more than 1.000 meter of climbing before we broke into two groups. The riding is much different than on the West side. On the West side one picks a series of climbs with impressive elevations and connects them by dotted lines, trying to get us much of them in as possible. One knows the climbs, they are continuous and one is motivated to make an effort, go up fast and reach the top, followed by some leisure time riding downhill. It is like working as a public official in the accounting department and having a wild weekend affair. 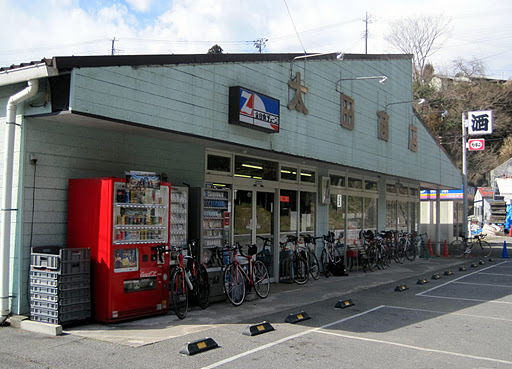 Riding in Chiba is more like the average marriage: The hills are not that high any more, but the sheer number of ups and downs adds up as well (or perhaps „adds down“ in this comparative case) and leaves its mark on the spiritual and physical condition of the participants. But being nice guys we decided something simple. We never saw Tim again that day. Then we made another stop at a nice country shop (now PE approved) somewhere in the middle of Bozo. My guess what be that our group made not only 50% of the total turnover in that shop on this day, but also 100% of the not-alcohol related turnover. I saw some locals dropping in with their typical agricultural mini cars and every single one of them left with a crate of beers. And nothing else. 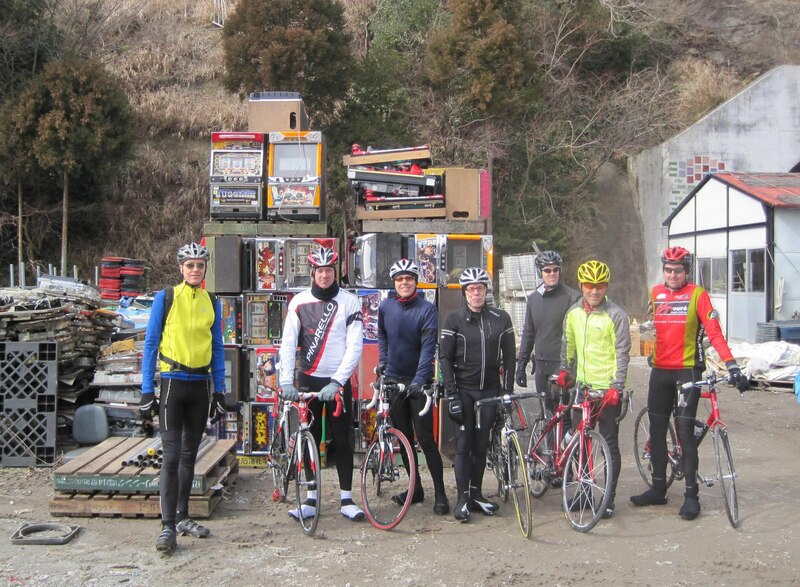 That should give you some idea what people in Chiba do on their weekends during winter time. It was nice and toasty (PE rule: The word „toasty“ should be used in every post at least once between December and March.) in the shop that has provided us with a seating arrangement at least as nice as a snack bar and the only equipment missing was a Karaoke machine and some 60 year plus old bar hostesses feeding as with mizuwari from our drinking bottles, peanuts and gently touching from time to time our shaved knees. 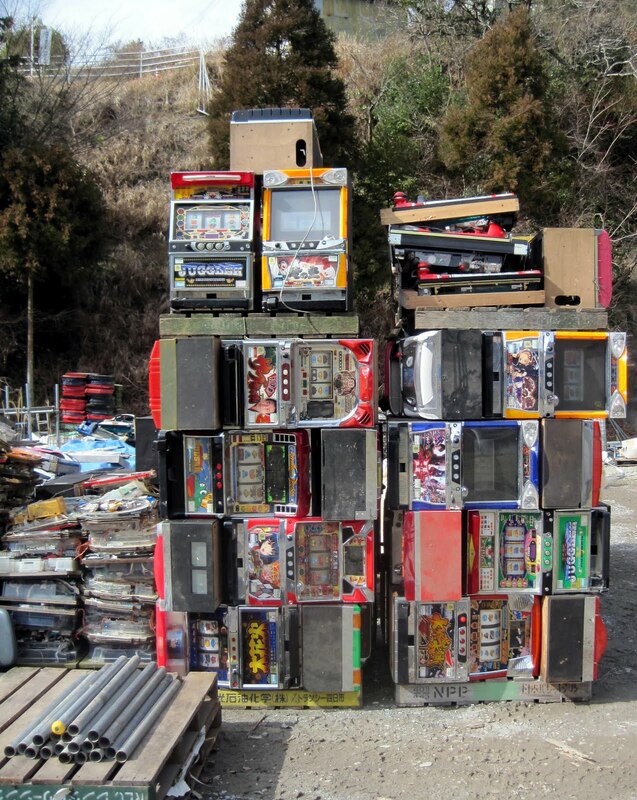 We also took a group photo there in front of some old slot machines at the scrape yard next to the country shop. A few kilometres later our group split, Phil leading the TCC guys back to Honda station and David, David and me riding along road 465 towards the coast to the town of Kanayamahma where we would take the ferry to Miura Hanto. Phil also suggested a smaller detour over a hill on a road (Ken 93) parallel to road 465. He suggested this climb in particular because he never did it before and wanted to know how it is. We were cruising then at good speeds along 465 and enjoyed the tailwind as we had quite some headwind going South all day before. Unfortunately the reason why we had this nice tailwind was, that we managed to miss road 465 somewhere and we were now heading North on road 410 towards the very ugly part of Chiba, bringing as far, far away from the ferry port. Luckily I had brought my Garmin Version (1.0, aka as a Chiba map) and we headed up to the village of Kururi where we took a turn on Ken 93 (where well hidden) and rode back to road 465. I started to bonk (no, not that) but luckily Dominic and James gave me a banana and a power bar so I felt much better than. It was the first time I ever ate a powerbar and I was surprised at the resistance it offers against being eaten. The consistency is similar to semi-liquid asphalt or dried squid and the energy required to eat it is more than the energy your body absorbs by eating it. Strange. But I felt better than. And finally we reached the coast and some minutes later the ferry port. I have checked the departure times of the ferries between 12 and 2 PM, however we were so late because of the many stops we made and the pointless ride we included (living up to this great PE tradition) that we only managed to catch the 4 PM ferry. This is a great ferry, designed in the Seventies and in service since then with plushy sofas, fancy chandeliers, toasty aircon and a strip show on the upper deck starting at 4.30 PM. Or we could have selected to see Tom Jones singing in the parking deck protected by a series of bulkheads. Recently some of the ferries had sunken because the loads were not probably secured on deck. 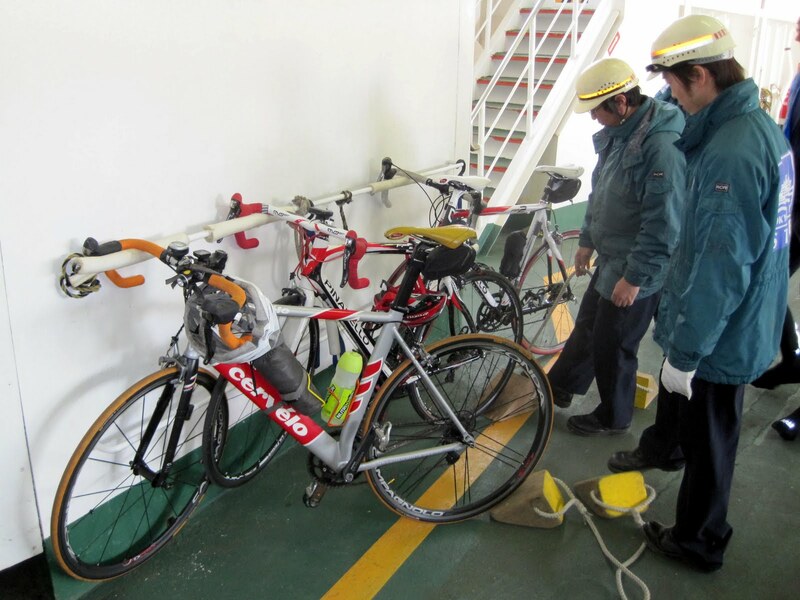 During the heavy seas which occur during the winter seasons in the bay of Tokyo, some of the vehicles have gotten loose, moved to either the starboard or backboard side and resulted in perpendicular inclination of the ferry. As one can see on the photo my Heavy Cervelo Soloist (8.9 kg) required therefore much tighter fixing than the relatively light Pinarellos standing next to it. In the middle of Tokyo Bay we saw the „Tokyo Express“ container carrier by Hapag-Lloyd moving in which made my immensely proud of all the useless stuff from Germany and other European countries that is carried year by year to Japan and actually sold here. I must be the equivalent to trade beads of the 19th century and in return our ships come home loaded with Toyota Hybrids which will be immediately forwarded to Toyota dealers for recall. In this context I would like to add that my son asked me yesterday evening if it isn’t dangerous for Toyota dealerships to intercept Toyota cars on recall as they couldn’t brake when entering the premises. And when we arrived in Kuriyama after having enjoyed a good meal on board (thanks to the Smutje), the strip show and seeing Dean Martin after Tom Jones, it was almost dark. David choose the train home from Kuriyama while David and me took the straight road towards Kamakura. On the trip I have shared many stories about the legendary Helga, her two brothers (not named David) and the German Seacastle restaurant that they operate at Kamakura but we did not had the time to drop in despite being very fast on the last stretch. But it was already dark and we just made it to Ofuna, packed our bikes and took the train home to Yokohama.